This is a rotating necklace display. With a maximum capacity of 17 necklaces this acrylic display gives you a large amount of functionality without sacrificing the same in retail space. With a rotating design browsing is made simple for your customers. Available in two different heights in order to accommodate longer or shorter necklaces. The simple design of the necklace display is not distracting and will fit in within any pre-existing design aesthetic. This rotating hook display is ideal for displaying keychains, jewelry, or any other accessories you wish to display. It features 9 hooks on each side, for a total of 18 hooks. This unit measures 8"w x 6 1/2"d x 12 1/2"h, and is perfect to place on a counter top. This acrylic necklace display holder is constructed in a rectangular form and displays multiple necklaces. It measures 15 3/8"w x 11 1/2"h. Choose from the color options below. Use this acrylic neckform display to showcase those special pieces in your collection. 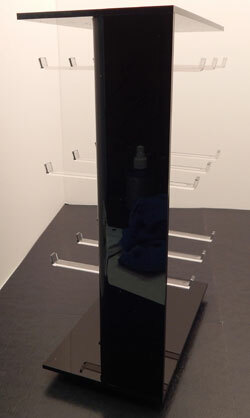 This acrylic neck form display measures 8 1/2"w x 11 1/2"h and is available in clear or black acrylic. Choose form the color options below. This acrylic neck form necklace holder display showcases multiple pieces at one time. It measures 7 1/2"w x 13 1/4"h and is available in clear or black acrylic.